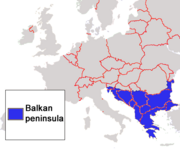 The Balkan peninsula. Nogai held suzerainty over Bulgaria, Serbia. Moldavia and Romania and territories within modern Poland, Belarus and Ukraine. Nogai (died 1299), also called Kara Nogai (Black Nogai), was a general and de facto ruler of the Golden Horde and a great-grandson of Genghis Khan. His father was Baul/Teval Khan, the seventh son of Jochi. His name is also spelled Nogay and Nogaj. Descended from a concubine, he was unable to claim the throne in his own name but exercised power through the khan, virtually as co-ruler of much of what later became Ottoman territory in the Balkans. His military successes constitute episodes in the later decades of the wider Mongol invasion of Europe. His domain extended into Russia; he brought Bulgaria under Mongol suzerainty, where his son became tsar. He also attacked Hungary and Poland. During his rise to prominence, he rampaged across Thrace, laying numerous cities to waste as he did so. Nogai became a Muslim and began a process of cultural adaptation that characterized Mongol imperialism. He married a daughter of the Byzantine Emperor, forging an alliance with his powerful Christian neighbor. In 1282, he helped his father-in-law suppress a rebellion. From the European perspective, the Mongols are usually depicted as representing a threat but the reality of Mongol rule was somewhat different; it represented what has been called a Pax Mongolica, which facilitated cultural exchange and trade between the East, West, and the Middle East in the thirteenth and fourteenth centuries. Marco Polo mentioned Nogai in his writing. Mongol incursion into and towards the European space helped to open European eyes to a world beyond their borders. As long as the Mongol Empire lasted, the Silk Road was safe for trade and travel. Over the long term, Nogai's legacy contributed to cross-cultural exchange and bridge-building, despite the devastation he caused during his earlier campaigns. After the initial Mongol invasion of Europe, Batu Khan left Nogai with a tumen (10,000 warriors) in modern-day Moldavia and Romania as a frontier guard. He was a nephew of Berke Khan as well as Batu Khan and Orda Khan, and under his uncle, he became a powerful and ambitious warlord. His name, Nogai means "dog" which refers to a Mongol totem. Silver durhams during Tulabuga's khanate. In his later years, Berke began to delegate more and more responsibility to his promising nephew. Nogai's leading role first appears under famous Mongol general Burundai as a battle commander in 1259, leading the second Mongol raid against Poland and plundering Sandomierz, Kraków and other cities with Talabuga. Nogai converted to Islam, as his uncle Berke Khan had done, but it is not known exactly when his conversion occurred, probably soon after Berke converted, in the 1250s. His name was included on the list of new converts sent by Berke to the Mamluk Sultan al-Malik az-Zahir in 1262/1263. Almost a decade later, in 1270/1271, Nogai himself indicated that he had embraced Islam in a letter to the Sultan of Egypt. Nogai Khan's father-in-law, Michael VIII Palaiologos. Nogai's father Buval died when he was serving under Hulegu. In 1262, during the civil war between Berke and Hulegu Khan, Nogai's army surprised the invading forces of Hulegu at the Terek river. Many thousands were drowned, and the survivors fled back into Azerbaijan. In 1265, Nogai led his army across the Danube, sending the Byzantine forces fleeing before him, and devastated the cities of Thrace. In 1266, the Emperor Michael VIII Palaeologus, anxious to make an alliance, gave his illegitimate daughter Euphrosyne Palaeologina to Nogai as a wife. That same year, Nogai lost an eye fighting his relative, Abaqa Khan, in Tiflis. But he lived on terms with Abagha and his successor Arghun after the death of Berke. Nogai ruled the Russians of Galicia-Volhynia, Ossetes and Vlachs (ancestors of Romanians) directly. Martin describes him as having "virtually autonomous control over the Western territories of the Golden Horde." His power as clan leader was so great "that he has been characterized both as a "virtual co-ruler" with the khan and as an independent ruler." He attacked Lithuania with the northern Russian princes in 1275. Unlike the successful invasion of Europe under General Subutai during the reign of Ogedei Khan over 40 years earlier, Nogai led an unsuccessful attack against Hungary in 1285 alongside with Tulabuga and Cuman troops. After ravaging Transylvania, he was beaten off by the Hungarian royal army under Ladislaus IV in an area near Pest and subsequently ambushed by the Szekely in the return. He also participated in the third raid against Poland in 1287 along with Tulabuga. But sources mentioned nothing about the result of their campaign. Some sources claim that they returned with 20,000 captives. A group of 4000 Mongol soldiers were dispatched by Nogai to Constantinople in 1282, to help his father-in-law emperor Michael to suppress the rebels headed by John I Doukas of Thessaly. But Michael died and Andronikos II used the allied troops to fight against Serbia. In 1286, he compelled the Serbian king Stephen Uros II Milutin to recognize his suzerainty. He also reasserted Mongol claims on Bulgaria, had the swineherd Ivajlo, leader of a mystical popular movement, murdered, made George Terter (1280-1302) his vassal and, after George's flight to Byzantium, set his own favorite Smilec on the throne. Despite his power and prowess in battle, Nogai never attempted to seize the khanate for himself, preferring to act as a sort of kingmaker. He served under Berke, Mengu-Timur, Tuda-Mengu, Tulabuga, and Tokhta. This last khan proved to be more headstrong than the others, and he and Nogai began a deadly rivalry. By this time, Nogai effectively had control of the western-most sections of the Golden Horde. He overthrew Tuda-Mengu and killed Tulabuga. He was unable to enthrone himself because his great grandmother was a concubine, although Marco Polo has it that Nogai reigned briefly. When he helped the young Tokhta to assume power, Nogai no doubt hoped to find in him a puppet to be manipulated or ignored as the case might be. Things turned out differently, for Tokhta (1291-1312), a man of exceptional ability, took in hands the reins of government with a marked will to rule. He won the first battle between Tokhta Khan and him. But He didn't want to chase Tokhta, because Nogai's grandson Agtji was murdered by Genoese in Crimea while collecting tributes from them. Then Nogai's Tatars plundered Italian ports in Crimea that were given to him by the khan. Nogai was killed in battle in 1299 at the Kagamlik, near the Dnieper, against Mongols under the legitimate khan. Because of his feud with Tokhta Khan, he was too dangerous to be kept alive. His head was brought to Tokhta Khan, who was offended that a mere Russian soldier had slain the mighty khan. He had the Russian put to death since "a commoner is unfit to kill a noble." Chini, one of Nogai's wives, with his son Turi, fled to Ghazan, who received them well and treated them with honor. His son by his chief khatun Alagh (Алаг), Chaka, became tsar of Bulgaria in 1299 but only survived until 1300. Nogai's name was borne by the Nogai Horde, who ruled east of the Ural mountains. Moscow developed "intimate contacts" with the Nogai Horde, "whose mobile nomadic forces could match those of the Great Horde." Williams describes Nogai Khan as a "throne-maker." His life was lived on the extremity of the Mongol Empire where it met with European and Middle Eastern spaces. He used conquest and alliances to consolidate and extend Mongol rule. Although a Muslim, he entered an alliance with the Byzantine Emperor. In characteristic Mongol style, he wanted on the one hand to extend the empire while on the other hand he wanted stability, the rule of law and commercial prosperity within the empire. His alliance with the Byzantine Empire fits a pattern of religious toleration across the Mongol space. The Mongols also refused to privilege even Mongols—apart from members of the Golden Family—over local populations once they had accepted Mongol rule. One of the lasting impacts of the Mongol Empire was that it unified large regions of the world, some of which were effectively ruled by Nogai. Although the Mongols ceased to be players in the Balkans, the Golden Horde would continue to expand in Russia, where it brought huge tracts of territory under a single government for the first time. The Golden Horde itself was multi-racial, consisting of Turks and Mongols. Nogai is remembered by Russian chronicles as fat tsar partly because his name translated as "fat" in Turkish and partly because this is said to have been a fitting physical description. ↑ Brian Glyn Williams. 2001. The Crimean Tatars: the diaspora experience and the forging of a nation. (Brill's Inner Asian library, v. 2. Leiden, NL: Brill. ISBN 9789004121225), 28. ↑ István Vásáry. 2005. Cumans and Tatars: Oriental military in the pre-Ottoman Balkans, 1185-1365. (Cambridge, UK: Cambridge University Press. ISBN 9780521837569), 71. ↑ A post Kievan Rus principality in what is now part of Poland, Belarus and the Ukraine from 1199 to 1392. ↑ Janet Martin. 1995. Medieval Russia: 980-1584. (Cambridge, UK: Cambridge University Press. ISBN 9780521362764), 171. ↑ Henri Cordier, 1920. Ser Marco Polo; notes and addenda to Sir Henry Yule's edition, containing the results of recent research and discovery. (London, UK: J. Murray), 496. ↑ Charles J. Halperin. 1985. Russia and the Golden Horde: the Mongol impact on medieval Russian history. (Bloomington, IN: Indiana University Press. ISBN 9780253350336), 59. ↑ George Vernadsky and Michael Karpovich. 1943. A history of Russia. (New Haven, CT: Yale University Press), 189. Cordier, Henri. 1920. Ser Marco Polo; notes and addenda to Sir Henry Yule's edition, containing the results of recent research and discovery. London, UK: J. Murray. Grousset, René. 1970. The empire of the steppes; a history of central Asia. New Brunswick, NJ: Rutgers University Press. ISBN 9780813506272. Halperin, Charles J. 1985. Russia and the Golden Horde: the Mongol impact on medieval Russian history. Bloomington, IN: Indiana University Press. ISBN 9780253350336. Martin, Janet. 1995. Medieval Russia: 980-1584. Cambridge medieval textbooks. Cambridge, UK: Cambridge University Press. ISBN 9780521362764. Saunders, J.J. 2001. The history of the Mongol conquests. Philadelphia, PA: University of Pennsylvania Press. ISBN 9780812217667. Vásáry, István. 2005. Cumans and Tatars: Oriental military in the pre-Ottoman Balkans, 1185-1365. Cambridge, UK: Cambridge University Press. ISBN 9780521837569. Vernadsky, George, and Michael Karpovich. 1943. A history of Russia. New Haven, CT: Yale University Press. Williams, Brian Glyn. 2001. The Crimean Tatars: the diaspora experience and the forging of a nation. Brill's Inner Asian library, v. 2. Leiden, NL: Brill. ISBN 9789004121225. This page was last modified on 6 October 2011, at 20:59.